On the night of September 17, 2001, a frail white-haired man in a red blazer walked to a microphone on the field of Busch Stadium II in St. Louis. In his shaking hands was a piece of paper on which he had written a poem for the occasion. It was Major League Baseball’s first day back to playing the game after the terrorist attacks of September 11. Baseball Commissioner Bud Selig said that Buck’s poem and his steadiness that night were what brought baseball back. ESPN rated the moment number 98 on its list of the hundred most memorable moments in sports of the past 25 years. For those who were at Busch Stadium that night, it was an experience that would never be forgotten. Sadly, but perhaps fittingly for such a patriot, it turned out to be Jack Buck’s last major moment in the spotlight. Shortly after the Cardinals’ 2001 season ended with a loss to the Arizona Diamondbacks in Game Five of the National League Division Series, Buck entered Barnes-Jewish Hospital in St. Louis for lung cancer surgery. He left the hospital for a period, but re-entered it during the winter for treatment of various conditions. He remained there until his death on June 18, 2002. Holyoke was 90 miles from the Red Sox in Boston and from Jack’s favorite player, Jimmie Foxx. Jack said that he learned about baseball from hanging out in the drugstore across the street from his home. Three men there assisted young Jack with writing a letter to the Red Sox manager, Joe Cronin, in which he suggested a lineup for the team. Cronin answered his letter and a few days after that used Buck’s lineup and the Red Sox won the game. Jack’s baseball loyalty switched to the Cleveland Indians when the family moved to the Cleveland area in 1939 for his father’s job. They bought their first house and relished being together. But Earle suffered from high blood pressure, and he died at the age of 49 not long after the move to Ohio. Jack was just 15. Kathleen Buck went to work in a sewing-machine factory to support her seven children and each of them helped as they could. In addition to selling newspapers, Jack also become a soda jerk at the Franklin Ice Cream Shop, where he met his first major leaguer, Oscar Grimes, a utility player with the Indians. The young Buck enjoyed listening to the Indians’ announcer, Jack Graney, who late in life would live in Bowling Green, Missouri, and listen to Buck’s broadcasts. Other favorites included Red Barber and Mel Allen in New York, Bob Elson in Chicago, and late-night Spanish broadcasts from Cuba. Jack had unthinkingly been calling games since his days in Holyoke, when he’d give play-by-play during games with his friends. He did the same when he and his brother, Earle Jr., attended Indians games. His brother would eventually tell Jack to “shut up” or Earle would move elsewhere in the stadium. Buck graduated from Lakewood High School in January 1942. The month before, he had been working at the ice cream shop one Sunday afternoon when word came over the radio about the Japanese attack on Pearl Harbor. Jack knew that meant his future was uncertain. After graduation he and a friend went to work on ore boats on the Great Lakes. He spent the next two years working on the boats as a porter, night cook, painter, and deckhand. Buck was transferred to Camp Stewart in Georgia, where he continued as an instructor. Then he shipped out for Europe on the liner-turned-troopship Mauretania in February 1945. The ship landed in Liverpool, England, and Buck was sent on to France and eventually Belgium. On March 7, 1945, he crossed the Ludendorff Bridge at Remagen, one of the few bridges remaining across the Rhine, and the site of a fierce battle a few weeks before. Buck was wounded on March 15 when Germans started shelling his position. Shrapnel pierced his left arm and leg, but missed hitting the hand grenade hanging from his belt. A medic bandaged him. Years later he and the medic met again at a banquet in St. Louis. The medic was Frank Borghi, goaltender for the 1950 US World Cup team that defeated England 1-0 in Brazil in one of the greatest upsets in World Cup history. When Buck was released from the hospital, after receiving the Purple Heart, he was given a two-day pass to Paris. That’s where he was on May 8, 1945, when the war in Europe ended. He remained in Europe until April 1946, spending much of his time either playing in or coordinating various sporting events for the soldiers. The GI Bill allowed Buck to enter Ohio State University in Columbus in the fall of 1946. He planned to major in radio speech with a minor in Spanish. He did his first broadcast in 1948 on the campus radio station, WOSU. While still in college, he went to work for a commercial station, WCOL. With absolutely no experience, Buck did play-by-play of Ohio State’s basketball games. After Buck did his first basketball game, his class was assigned to listen to him and critique his performance. The most devastating criticism came from his professor, who told him, “You’d better find something else to do for a living.” Buck ran into the professor in 1970 en route to New Orleans to broadcast the Super Bowl. Point made! In 1948 Buck eloped to Kentucky with fellow student Alyce Larson. They would have six children – Beverly, Jack Jr., Christine, Bonnie, Betsy, and Danny – before divorcing in 1969. With his second wife, Carole Lintzenich, he had two more children – Joe and Julie. Buck graduated from Ohio State in December 1949. He remained with WCOL, which started broadcasting the games of the Columbus Red Birds Triple-A farm team of the Cardinals. Buck had to audition for the Columbus general manager, Al Banister, to be allowed to do the games. His audition consisted of re-creating an entire baseball game from a play-by-play account in The Sporting News. He got the job and for the first time of many headed to Florida for spring training. Buck did manage a coup that spring back in Columbus when the Red Sox came through to play an exhibition game on their way home to Boston. He snagged a media-resistant Ted Williams for a 30-minute interview, which Buck termed more of a speech. He was glad to have it, however, as it pleased his bosses. Buck missed doing sports, but baseball re-entered his life in 1953 when he got the job of broadcasting the games of the Rochester Red Wings, the Cardinals’ International League farm team. Then the Anheuser-Busch Brewery bought the Cardinals, including its farm teams. “The timing was exquisite,” said Buck. D’Arcy, the advertising agency for Anheuser-Busch, hired the baseball announcers. 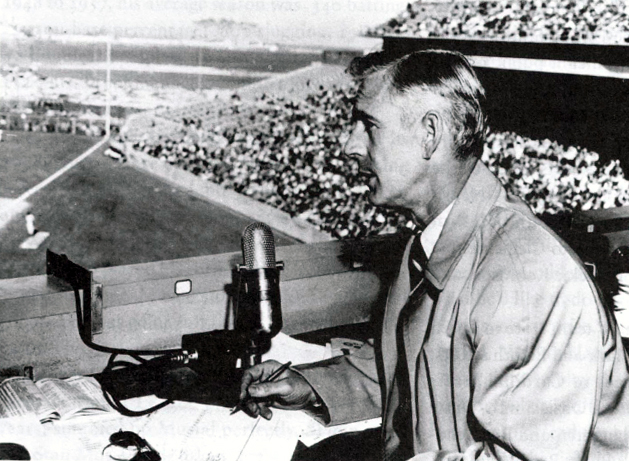 Buck auditioned for the chance to join Harry Caray in the Cardinals booth by having him broadcast a game between St. Louis and the New York Giants at the Polo Grounds. He waited for weeks to hear if the job was his, and finally the word came. In 1954 he would be broadcasting in the big leagues. Buck felt that he might be doomed from the start when he received a tape of Caray’s work from the Cardinals and was told, “This is the way we want you to broadcast.” Any good broadcaster knows that he has to develop his own style and Buck’s and Caray’s were not at all alike. Their personalities didn’t blend real well either, especially since Caray had wanted someone else for the job. The Cardinals broadcasts were on KMOX, the CBS affiliate in St. Louis. At the time, St. Louis was the westernmost city with a major-league baseball team and the Cardinals’ fan base extended well beyond that of most teams. All three men in the KMOX booth in 1954 would go on to receive the Ford Frick Award giving them a plaque in the Baseball Hall of Fame – Buck in 1987, Caray in 1989, and Hamilton in 1992. But 1954 was the only year all three worked together. Joe Garagiola, a St. Louis product who caught for the Cardinals, Pirates, Cubs, and Giants, replaced Hamilton in 1955 and become Caray’s protégé. While Buck was excited to be doing major-league games, his situation was also frustrating as Caray pretty much controlled the booth and decided who did what. Harry didn’t like to have anyone else be on the mike when something exciting happened, and since that was impossible to predict, he did most of the innings. With Garagiola traveling on all the road trips with Caray in 1955, Buck was left behind in the St. Louis studio to do commercials and update incoming baseball scores. However, the time allowed him to expand into other sports. He did bowling, soccer, and wrestling on the radio. As the 1950s rolled along, the Cardinals were not winning any pennants and Buck was still the odd man out in the broadcast booth. After the 1959 season, when former Cardinals player Buddy Blattner was added to the team, Buck was out totally. He got the word that he was fired just before Christmas. “We had just built a six-bedroom house with a swimming pool and had bought all new furniture, on credit of course,” wrote Buck in That’s a Winner! “I had to find a job quickly, or I’d have to sell the kids.” Enter Bob Hyland. In St. Louis the name Bob Hyland is legendary for his masterful management of KMOX Radio, which was the king of the St. Louis airwaves and often the top-ranked station in the country. Hyland persuaded Buck not to go after a baseball job in another city, feeling certain that he would eventually get his job back with the Cardinals. In the meantime, he had plenty of ways to use the announcer’s talents. Buck did a nightly show from Stan Musial and Biggie’s Restaurant, playing records and doing interviews. He did other sporting events and he did an interview show called “At Your Service” which became key in radio history. Hyland decided to do away with musical programming and go all-talk. KMOX was the first station to do this, creating a brand-new format that remains popular today. Jack also started doing public appearances and became the most sought-after emcee in St. Louis for banquets and other events. Many of the events were for charity, such as the Cystic Fibrosis Association, one of Buck’s top priorities. One year he appeared at 385 events. To satisfy his sports interest, Buck did baseball games for ABC-TV, as well as the Big Ten Basketball Game of the Week. He was one of the first announcers to do American Football League games and created the Pro Bowlers Tour with Chris Schenkel. He did minor-league hockey for the St. Louis Braves and then announced the first games for the National Hockey League St. Louis Blues in 1967. Where Buck really wanted to be, of course, was back in the Cardinals’ broadcasting booth. Blattner had moved on to the expansion Los Angeles Angels, and Caray and Garagiola had had a falling-out. Joe moved on to NBC and Harry again needed a partner. While Caray was still the dominant figure, he and Buck got along better this time. It was an exciting time in St. Louis. Gussie Busch, owner of the brewery and the Cardinals, built a new stadium in downtown St. Louis that opened in 1966. The 1960s were also great years for the team. St. Louis played in three World Series during the decade, beating the Yankees in 1964 and the Red Sox in 1967, but losing in 1968 to the Tigers. After the many years of being Caray’s unappreciated sidekick, however, Buck was ready to move on as the ’60s came to a close. His salary had been stuck at $20,000 a year and he felt stuck as well. Then Caray failed to follow an instruction from Busch and was fired. Buck was offered Caray’s contract. Finally, after 16 difficult years, the booth would be his. Buck needed a partner for the 1970 season and his first choice was the retired Red Barber. Barber, the longtime Dodgers announcer, had been fired by the Yankees four years before and was interested in getting back in the game, “but my wife would kill me.” The job eventually went to Jim Woods, an uneasy fit, and Woods left after two years. In the spring of 1972 former Cardinals outfielder Mike Shannon, a novice at broadcasting, became Buck’s partner and would remain that for the rest of Buck’s baseball career. Shannon, a St. Louis native, had been a popular player but was forced to retire early because of a kidney ailment. Buck continued to do pro football for a number of years, including broadcasting the memorable Ice Bowl game in Green Bay in 1967. Although he did some TV work, most of his football coverage was also on radio. He and former coach Hank Stram did radio coverage of the Monday Night Football games for CBS for almost two decades. As to why he fit better on radio than TV, Buck once said, “In television all they want you to do is shut up. I’m not very good at shutting up.” He also felt that television coverage of baseball and other sports was more centered on the analyst, not the play-by-play man. Probably the greatest example of Buck’s discomfort with TV came in 1975, when he became host of a new studio sports show on NBC called Grandstand. It meant giving up his job with the Cardinals, at least in 1976. Grandstand was a failure pretty much from the beginning. It was badly produced, which made it difficult for Buck ever to get comfortable with the format. He was eventually fired and went back to broadcasting baseball. The 1970s had been another bad time for the St. Louis Cardinals. The team had gotten sloppy and Buck was often embarrassed by how the players dressed for flights and by how they acted. Manager Red Schoendienst was fired after the 1976 season, but things didn’t improve – until Whitey Herzog came to town. Buck wrote, “I was immediately impressed with Whitey and the way he went about his business. He is the smartest person I’ve ever met in baseball.” Herzog guided the Cardinals to three more World Series in the 1980s. They beat the Milwaukee Brewers (then in the American League) in 1982, but lost to the Kansas City Royals in 1985 and the Minnesota Twins in 1987. Equally memorable was his call on CBS Radio during the 1988 World Series when Kirk Gibson, though hobbled by injuries, smashed a pinch-hit home run to win Game One. “Unbelievable! The Dodgers have won the game on a home run by Kirk Gibson! I don’t believe what I just saw!” Even though that was a radio call, it is often played when Gibson’s trot around the bases is shown on TV. Buck made one more foray into television, in 1990 when CBS hired him to do the number-two game on its new Saturday baseball broadcast. Before the season even started, however, he was moved up to the number-one game when Brent Musburger was fired. Jack was teamed with Tim McCarver, whom he knew well from McCarver’s playing days with the Cardinals. As had happened before, Buck was relegated to second place and the duo never quite clicked. He was fired in 1992. One of the greatest joys of Jack Buck’s life was the arrival in the broadcast booth of his youngest son, Joe. As a boy, Joe had spent a great deal of time with Jack in the booth, going on road trips, and he took it all in as a very proud son. On Joe’s 18th birthday, Jack and Mike Shannon felt the young man was “ready for prime time” and left him alone in the broadcast booth to do an inning of a Cardinals game. He didn’t let them down. As Jack’s health deteriorated in the 1990s, Joe became a regular part of the KMOX team on the Cardinals’ broadcasts. Starting in 1995, Jack cut back on the travel and Joe was Shannon’s partner on road games. When Mark McGwire was vying for the home run record in 1998, it was Jack Buck who was at the microphone to call number 61, which tied McGwire with Roger Maris. As Busch Stadium went crazy on that Labor Day afternoon, September 7, Buck said, “Pardon me while I stand up and applaud. What a Cardinal moment this is. What a baseball moment this is.” It was Joe who delivered the national television call for number 62 one night later. Joe said, “I have no idea how, but his voice has been stronger lately. It’s like he’s putting every ounce of energy God can give him into those three hours of the broadcast.” And Cardinals fans did not want to let him go. Buck had the knack for making the game real, “like talking baseball with the guy across the backyard fence,” wrote Reilly. On the evening of June 18, 2002, the Anaheim Angels played in St. Louis, the first time the two teams had ever played each other. Darryl Kile was on the mound for the Cardinals in what would turn out to be his last game before his sudden death from a heart attack four days later in Chicago. With Joe Buck broadcasting, the Cardinals won the game, 7-2, a win that put St. Louis into first place in the National League Central. Joe rushed from the broadcast booth to the hospital to tell his dad. Apparently, that was the news Jack had been waiting for. After months in the hospital, after several surgeries, after losing the ability to speak (Joe compared the last indignity to being like “a great pianist with broken hands”), Jack Buck died just an hour after the game ended. His Cardinals were in first place and he’d let the Angels take him home. Joe called KMOX with the news and a makeshift memorial quickly started to grow around Jack Buck’s monument outside Busch Stadium II. The radio station that had invented the call-in talk show format put it to good use over the next few days. Tributes poured in from around the country and from all kinds of people. No matter how famous or ordinary the person, they all loved Jack Buck because he loved them. A ceremony to honor Jack Buck was held at Busch Stadium two days after his death, with his coffin resting at home plate. A Budweiser Clydesdale stood guard nearby. The funeral was held the next day. Many baseball and other sports figures attended. Kristen Lokemoen. “So long, for just a while.” Show-Me Missouri Magazine, Fall 2002, 12-14. Content used with permission from the publisher.